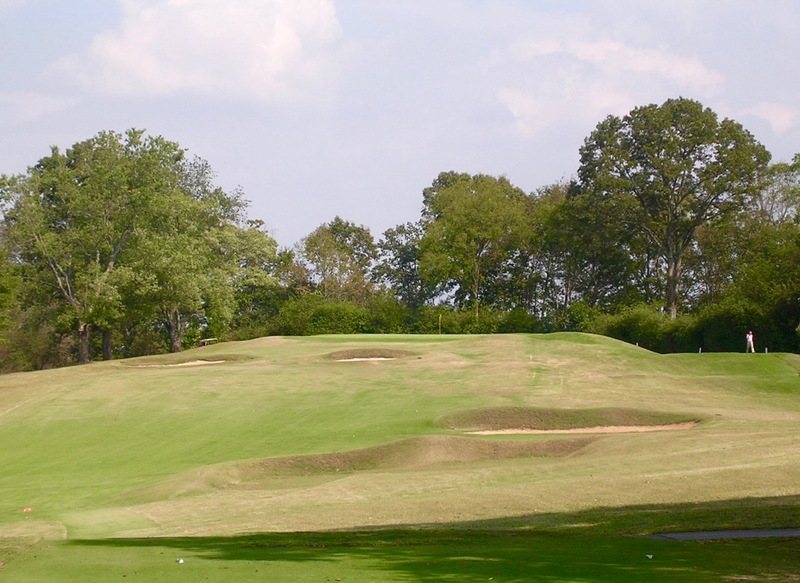 The par-4 15th is one of the most striking at Holston Hills, defined by a phalanx of bunkers strung diagonally across the fairway. This photo is prior to the club’s tree removal program, which has brilliantly opened up views across the property and allowed for the growth of meadow grass buffers. 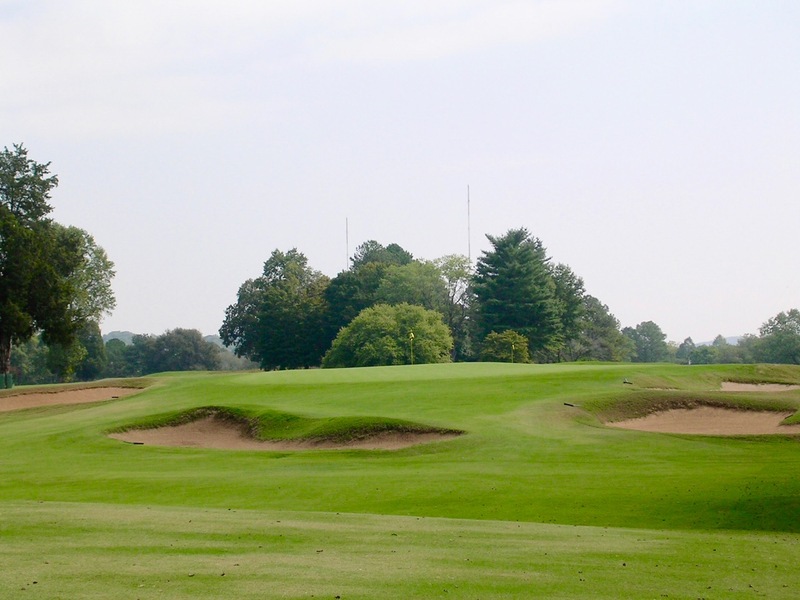 Holston Hills has the reputation of being a Donald Ross course that time forgot because so little has supposedly changed over the years. 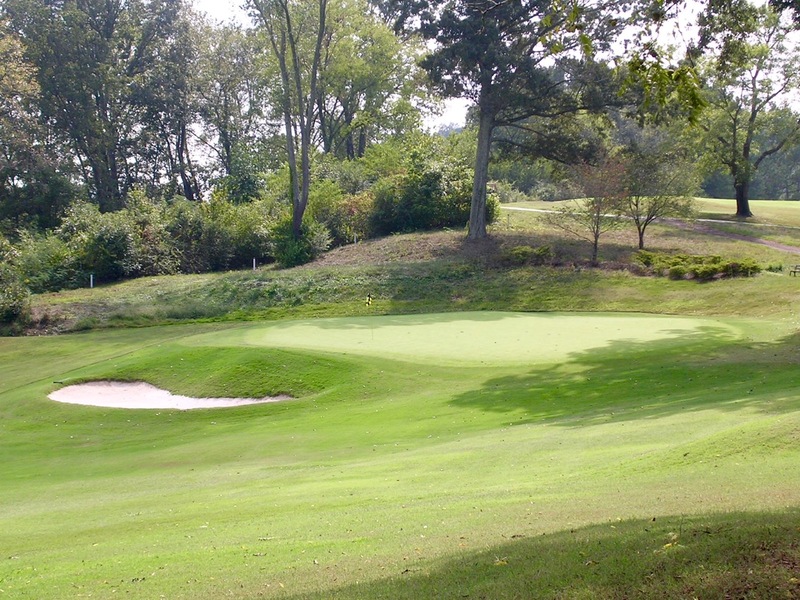 The story is that the club, increasingly located on the “wrong” side of Knoxville and challenged to hold onto members, never had the money to unwittingly hire an architect to come in and modernize the course, as was the case with so many Ross and other Golden Age courses in the’50’s and’60’s (and later). …to an uphill green sloping away on all sides. The small green at the par-3 14th, cut into the bank of a shady glade, is one of the swiftest and most tilted on the course. The opening and closing holes of each nine run up and back over a mildly tilting incline beneath the elevated clubhouse. The ground is more nuanced — and interesting — at the flanks of the property, with the eastern side flaring up toward a ridge at the boundary and a ravine cutting through the center on the western half. Ross, naturally, sniffed out these areas for green sites along with some nice higher ground on the south side for the 7th and 8th greens. The par-4 16th, just 300 yards, outpunches its weight, with an uphill drive and a feisty pitch to a blind, crowned green. These landforms, and bunkers cut into upslopes, give the holes a sense of motion that’s more obvious from fairway than the tee. 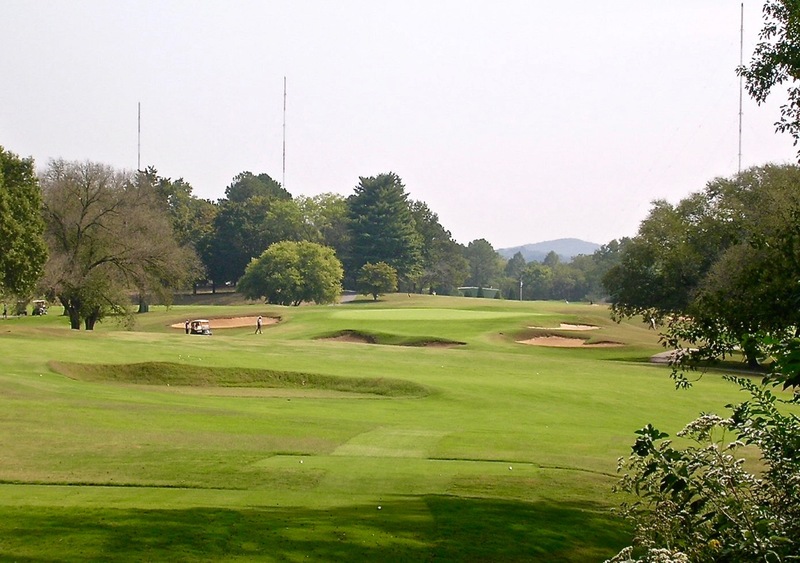 You learn driving diagonally across to the par-4 2nd’s hogback fairway that you’re playing along the ground as much as through the air, and the realization continues at the 3rd where the fairway drops into the ravine past a cluster of fairway bunkers leaving a blind, uphill approach to a sloping green. 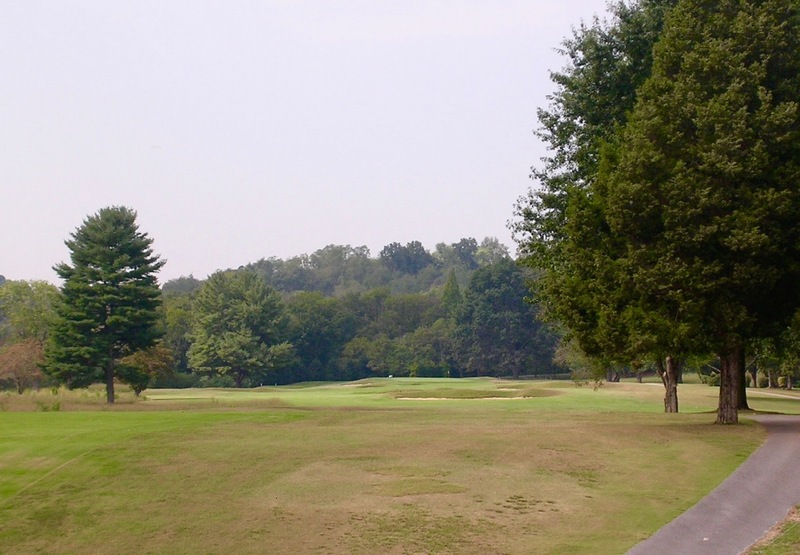 The all-star 6th is Holston Hills defined, a short par-4 with a heavily canted fairway that drops then rises toward a plateau green. The 13th begins another stretch that uses a ridge, a hollow and a knob of hill to inspired effect, capped by the 306-yard 16th running up a narrow slope to a slippery pitcher’s mound green (with OB right behind). 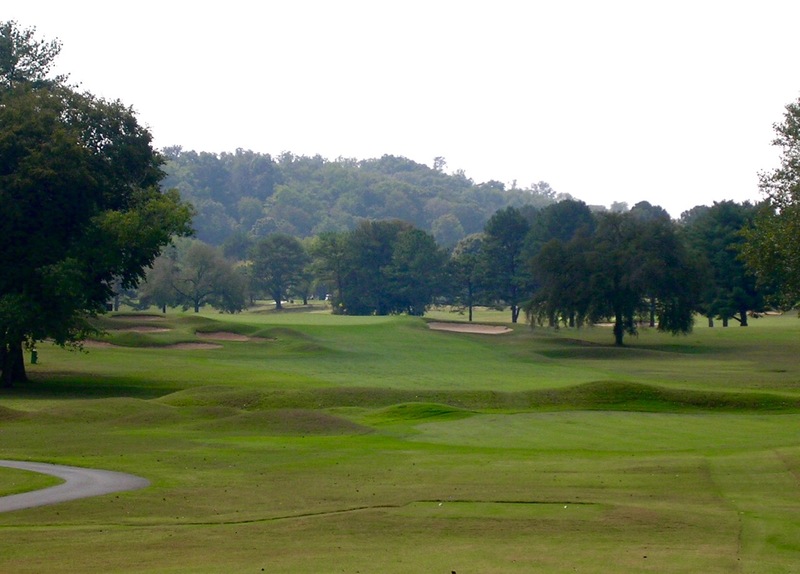 At 600 yards, the par-5 6th crosses a ravine and then traverses a long, flat stretch toward the northwest corner. Cross bunkers make the second and third shots interesting.